The Union County Board of Chosen Freeholders is pleased to announce a special matinee performance during the Presidents’ Day holiday from the Grand Falloons entitled “Professor W’s Earth Science Circus” as part of Trailside’s February Festivities on Monday, February 20 at 1:30 p.m.
“This laugh-out-loud assembly, with guaranteed audience participation, is a fun way for the entire family to learn about the importance of recycling,” said Freeholder Chairman Bruce H. Bergen. 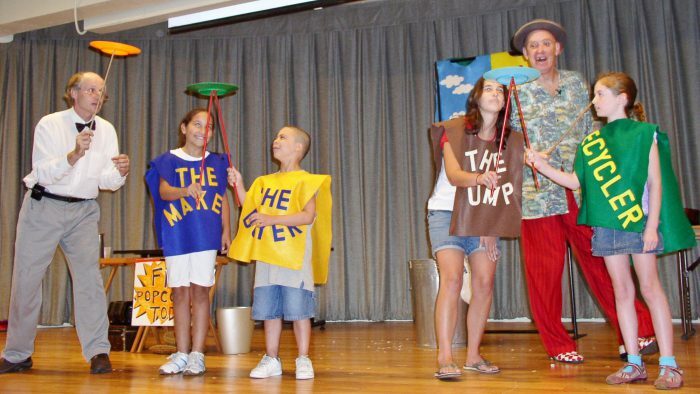 Sponsored by Union County Clean Communities, Professor W.’s Earth Science Circus promises magic, juggling and exciting circus fun. Members of the audience will be asked to assist Professor W. on a unique and lively exploration of “our earth.” The program is recommended for children four and up. Space is limited and tickets go on sale at 1:00 p.m. Monday, February 20 at the Visitor Service Desk. No strollers please. The fee is $5.00 per person and $4.00 for seniors. In addition to the matinee on February 20, visitors of all ages will have the opportunity to meet “Curby,” Union County’s new, fun and interactive Recycling Robot from 12:30 to 3:00 p.m. in Trailside’s lobby. Curby is a fully animated robot that moves, speaks, listens and plays music! Enjoy learning how you and your family can become more environmentally aware and help to prevent litter. Trailside offers additional programming for this special holiday weekend. The Journey of Sap to Syrup meets 11:00 a.m. to 12:00 p.m. on Saturday, February 18 or Monday, February 20. Learn the process of how 100% real maple syrup is made from the sap of the sugar maple tree. Find out what equipment is needed to collect sap and take a walk to see a tapped sugar maple tree. Take part in a taste test to see if you can identify the real thing. Animal Clue Winter Walk and Campfire, is offered 3:00 to 4:00 p.m. on Saturday, February 18 or Monday, February 20. Have fun learning to identify birds and other animals at the Backyard Wildlife Habitat feeders. Challenge your natural history skills on a winter walk in search of animal tracks, nibbled twigs and other signs that tell us our animal neighbors have visited. Conclude your outdoor investigation around a warm campfire with hot chocolate and marshmallows. Featured on Saturday, February 18 from 1:30 p.m.to 2:30 p.m. is a Kindling Kit workshop. Keeping warm by an open fire has a lot of appeal, but getting the blaze going can be tough. Participants will learn how to start a fire blazing with tinder and kindling. Work with your family to gather sticks, twigs, holly, evergreen sprigs and pine cones to create a kit that is both decorative and useful to get a fire started. The fee for each program, The Journey of Sap to Syrup, Animal Clue Winter Walk and Kindling Kits is $5/person for residents of Union County and $6/person for out-of-county residents. For additional information about programs offered during February Festivities, winter workshops and special events, please call 908-789-3670. A new online registration system designed to make access to our Parks and Recreation services easy and convenient has been adopted. Register for Trailside’s programs online at www.ucnj.org/trailside and create an account and password. Trailside Nature and Science Center is located at 452 New Providence Road in Mountainside and is a service of the Union County Board of Chosen Freeholders.